Before plugging things into the BeagleBone, it’s generally a good idea to shut it down and remove the power source from it. 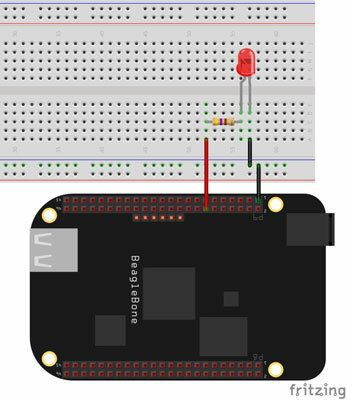 Using a jumper wire, connect the BeagleBone’s 3.3V source — pins 3 or 4 on header P9 — to the breadboard’s positive track. 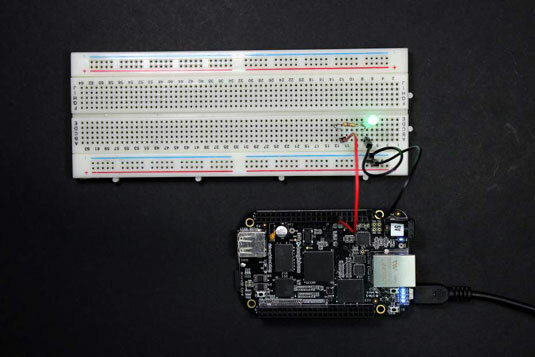 Connect the BeagleBone’s GND pin —for example, pins 1 and 2 on both headers — to the breadboard’s negative track. Connect a GPIO pin to the board. This example uses GPIO 40 — pin 14 on the P9 header. Use a jumper to connect it to a vertical row on your breadboard. Without a resistor, an LED burns up easily. A 220 or 470 resistor should drop enough voltage without reducing the LED’s brightness too much. Connect the resistor to the jumper you pulled from pin 14, effectively connecting the resistor to GPIO 40. Connect the LED’s negative leg — the cathode, which is usually the shorter leg — to the breadboard’s negative track where you connected ground in Step 3. Connect the positive leg — the anode — to the resistor. In the circuit you’ve just built the power comes from GPIO 40 rather than a battery, which you turn on and off by writing into the command prompt. In Step 2, you connect the BeagleBone’s 3.3V pin to the breadboard. In reality, for this specific project, making that connection serves no purpose. It’s generally good practice, however, to always have the horizontal tracks on your breadboard powered with a constant voltage and with a circuit ground. If you were to connect the resistor to the positive rail on your breadboard, the LED would light up, but you’d have no control over it. Feel free to try it out! Because pin 14 is already a GPIO pin by default, you can set it as output. After you’ve done that, you can easily control whether you want the LED to be on or off by setting the pin to HIGH or LOW, respectively. If the LED seems dim, try a lower resistance value. Do not go lower than 220, though. When you’re done with a pin, it’s often a good idea to unexport it so that it becomes available for different purposes. You unexport the pin by writing into the unexport file. 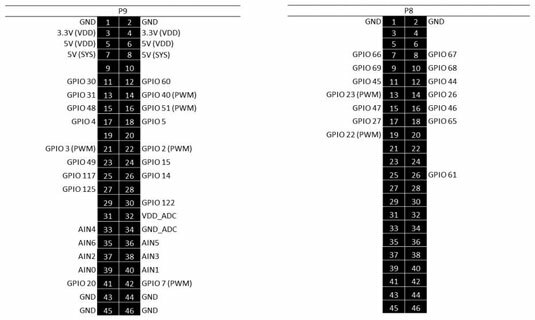 The following succession of commands unexports gpio40 and shows that its directory has been eliminated. If you’re successful in controlling the LED, you may have just taken your first big step into digital electronics. Although lighting up an LED may not seem like much, the concept behind it is pretty much the same as controlling a motor, a buzzer, or an LCD screen!